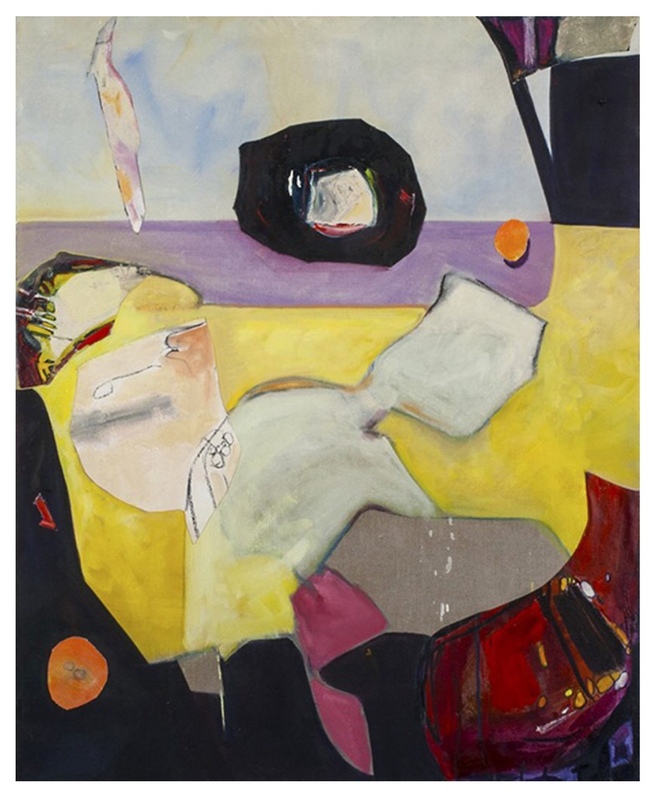 In her diverse series of paintings and collages Gail Winbury expresses reflections on love, identity, feminism, aging, and mortality – with psychological and emotional resonance. For Art Spiel she elaborates on her formative experiences as an artist, her work practice, and thought process. AS: Tell me what brought you to art. Gail Winbury: Emotional honesty is a core value of my life. The art I love seeks that. Art has always been part of my life. As a child, I painted with my father. As a teen, I was offered a solo show based on a pop-art rendition of The Scream. In college I studied art but dropped out to work in the antiwar movement. When I was ready to return to school, my mother advised: “a woman needs to support herself.” I loved psychology as well as art, and pursued my doctorate in psychology. For years, I had a thriving practice and also worked at Rutgers University. During this time, I continued to practice and study art. To me psychology and art are similar, both are languages for understanding the soul. 20 years ago I had an epiphany. I did not want to be an 80-year old woman who never seriously pursued her art. I began to close of my psychology practice and trained seriously to become a professional artist at SVA, in Europe and elsewhere. But there was also this seminal moment in my early 20s. I lived in the country and frequently rode my bike to a farm. Every time I stopped to stare at the light on the barn to take in that deep, rich red – brown color. I remember thinking – I can gobble up that color. That moment stayed with me. AS: You say that your art begins and ends as a psychological and emotional exploration. Can you talk more about that? 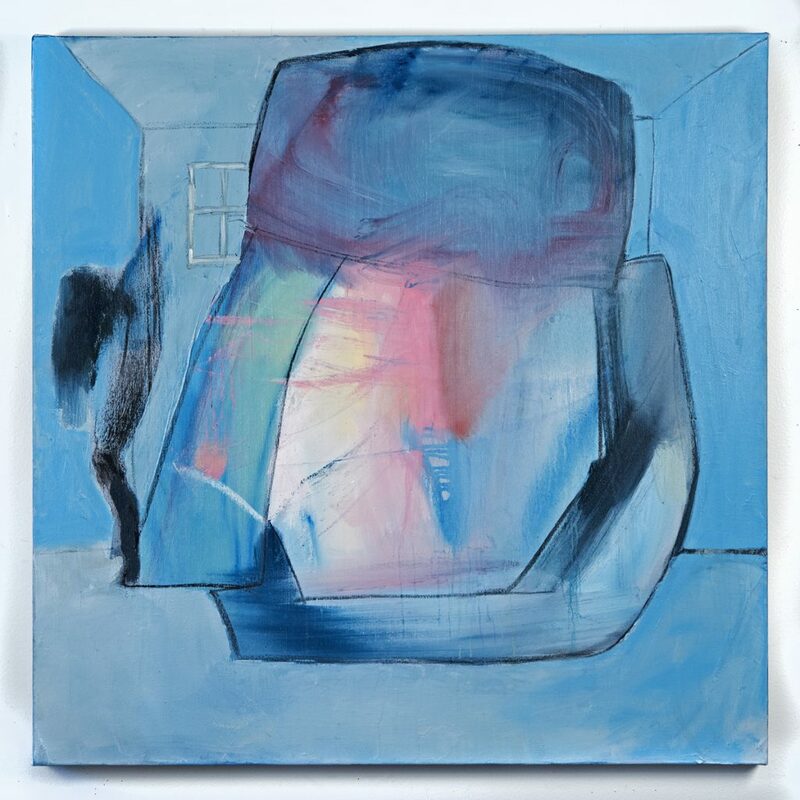 Gail Winbury: While the formal elements of the work are always important to me, what is equally important is that I communicate psychological and emotional meaning. I want the viewer to feel something real in relationship to the work. I am interested in the big issues of the human condition: love, identity, feminism, aging, and mortality. In my paintings there are tensions that I develop by opposing formal elements. In A White Scintillation Broke, for example, I have powerful activated brush work done in soft colors. Such visual dialectic aims to slow the viewer down from a frenzied “plugged in” pace. It encourages questioning and confusion. If there is enough surprise, ambiguity, and inherent beauty in the work, the viewer is prompted to contemplate. That moment of introspection creates room for the viewer to project herself into the piece. But sometime I create what is a more immediate visceral experience. There the viewer is stopped and feels an emotional connection to the work. Psychology and art are closely connected. My art uses visual language to communicate feeling and beliefs on a level that is not always directly conscious, and about feelings that may occur before the acquisition of language. AS: You are both painting and working in collage. What can you tell me about the relationship between the two in your work? Gail Winbury: I had a Visual Arts fellowship in Italy, painting in a castle from 10 hundred, AD. My studio had no electricity and I had to walk what felt like a mile to clean my brushes. That is how my collage practice took off. I travel a lot and live in Mexico part of the year. Collage is a very portable medium. Initially I thought there was no relationship between the two, just two different mediums. 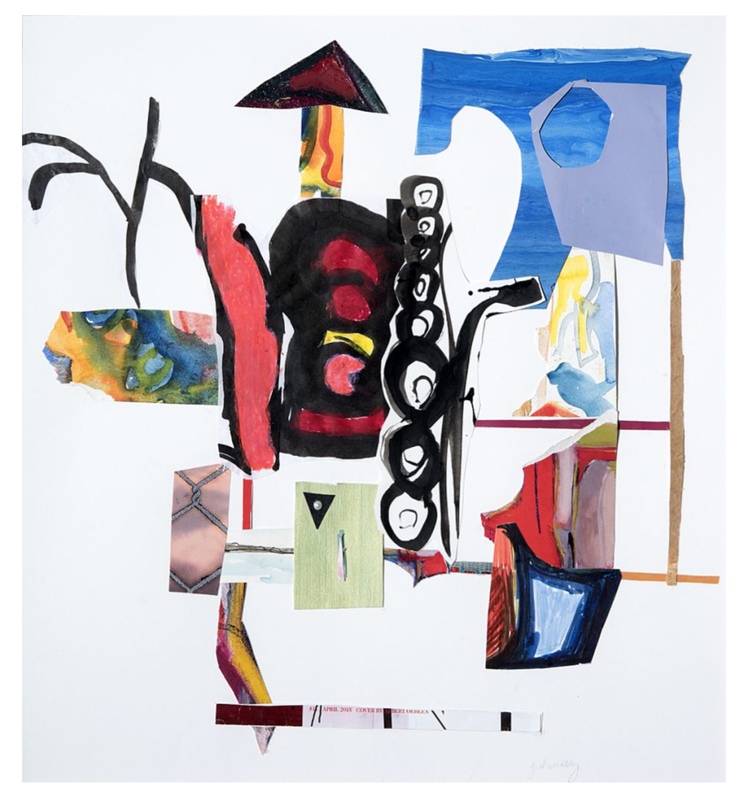 I am a colorist at heart but in the collages, I explore negative space, form, and deconstruction. These collages are composed from torn bits of old paintings on paper and canvas, drawings, and found objects, predominantly my own work. There is a sense of humor and whimsy in my collages. A Riff On Now And Then, for instance, contains paper over 50 years old and a paper doll from my childhood. 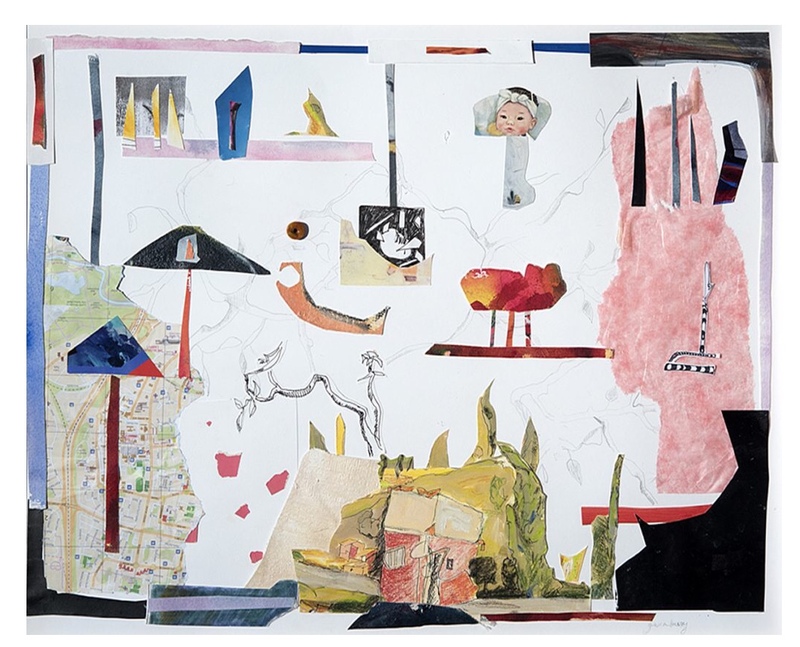 Collages give me a place to experiment and play; a relief from my serious large paintings (such as She Told Them No). My collages often contain 3-d elements, and help me expand the 2-d picture plane, which results in blending oil painting and collage. Sometimes I cut up two previous paintings on linen that held elements I loved and create a collage on top. In my new series , Neither Water nor Air, I am combining oil paint and cold wax, then adding fabric and drawing. This came out of my collage practice, merging drawing, painting, and collage. AS: You attended in 2016 an Artist Residency and Exchange in Arad, Israel. What can you share about this experience and how did it affect your work? 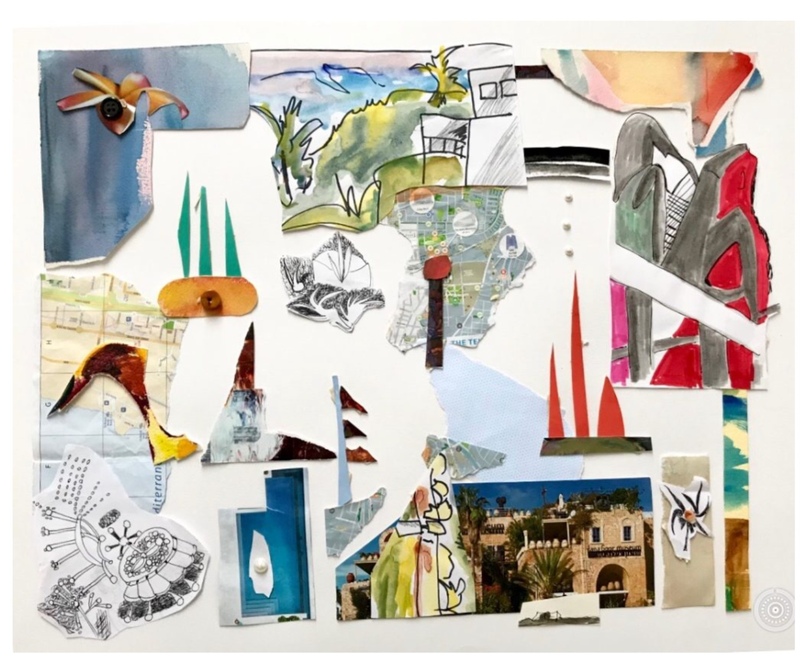 Gail Winbury: With several other artists from the States, I was awarded a grant to create art and to connect with the artists of Arad, Israel. Arad was a planned city during the 60’s but forgotten by the current government. While there, I led a workshop with some Israeli artists in the artist quarters in Arad. The workshop, Finding Your Visual Language, uses exercises developed by artist Joan Snyder (with permission). I lived in Arad with a wonderful Moroccan-Jewish family. I shared meals and evenings both with the family and large groups in this close-knit community. One night we ate and danced in the streets of the city, and at midnight swam in the dead sea. I loved the honesty, directness and spontaneity of the Israelis I met. Daily I walked to experience the vastness and quietness of the Negev desert. While in Israel, there was little time to paint. I brought some small torn pieces of gessoed canvas, and made a few paintings in Plein Air under the blazing sun. From the trip I produced a series of 8 paintings which I think of as genetically linked, like a tribe. The first piece was 48” x 48” and an intuitive painting. I used the composition of the first piece as the basis of the second painting. Then the composition of the second painting was the basis of the third, and so forth. Obviously, the work was not identical but it was visually linked through similarities in the formal structure, which simplistically can be read as aerial landscapes of the Negev. Some of the pieces were disturbing, as Israel, like any country has its problems. I also painted some more traditional abstract landscapes as an homage to my love of the people, the city, and the desert. AS: Let’s take a look at your earlier body of work which you describe as exploration of the female body and power. Can you elaborate on this body of work? Gail Winbury: I think female sexuality is distinctly different from men’s. Historically, most paintings of women have been through the male gaze. For years I was in an argument with De Kooning. I loved his work, but not his objectification of women whom he represented as aggressive slashes, gorgons, and medusas. 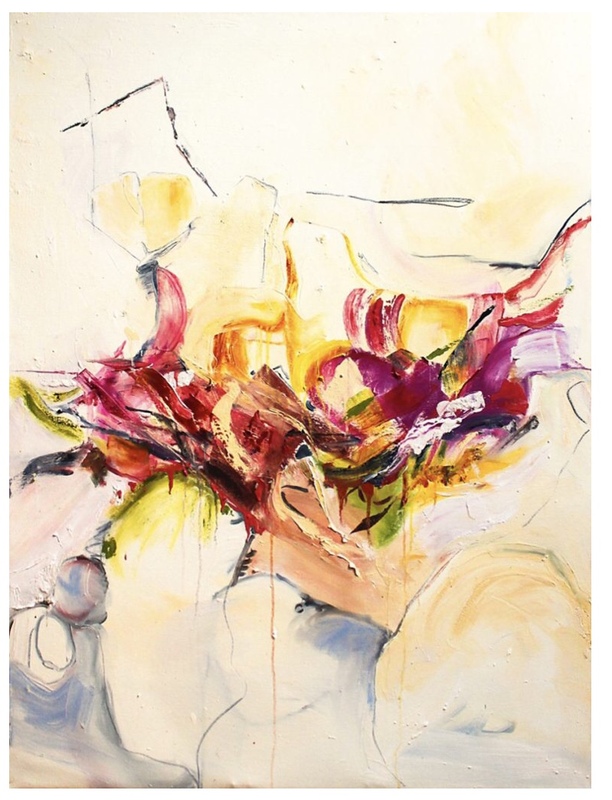 I took back his luscious pinks and the painterly expressive gesture to create large oil paintings about women’s bodies and strength. The viewpoint was a woman’s – emphatic and from the inside-out. On occasions, reactions to these paintings were divided based on gender. 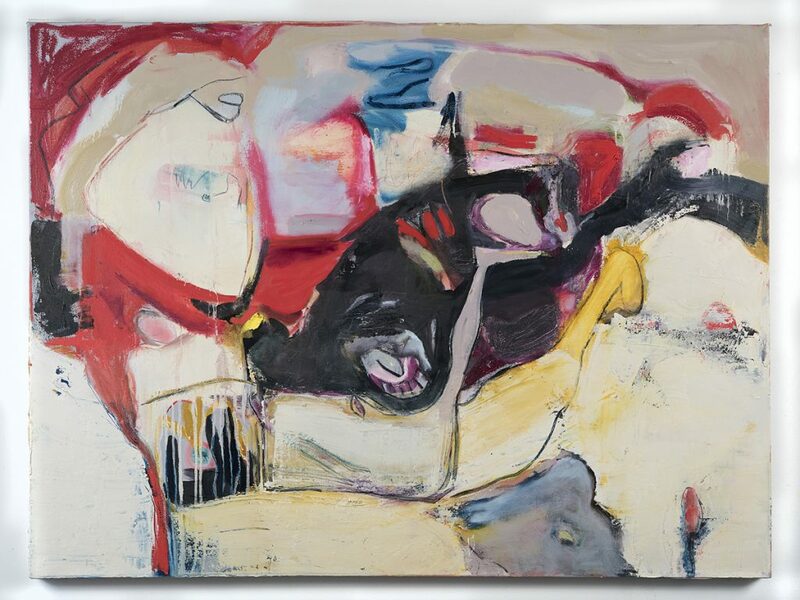 During a solo exhibition in 2013, one room in the gallery was filled with gestural paintings predominately in pinks and salmons. Women tended to congregate in that particular room, while the men stayed in the two other gallery rooms. Another time, during a residency at SVA, a piece I completed during the residency was loved by women (faculty and students) but was ignored or disliked by the men. In discussing the reaction, one of the female faculty said, “This piece is about female sexuality, it’s about our space, there is nothing male in it.” Interestingly, most of these paintings sold. AS: In a later painting series, All About Time, you contemplate the transience of life. You say that it derived from the loss of your parents. What can you tell me about these paintings? Gail Winbury: This series began with an inability to use much color. I walked into my studio and could not stand all the vibrant warm colors in my work. I limited my pallet to blacks, blues ,ocher and some white. I didn’t know why at first, but I just worked. In time I realized that it was the anniversary of both of my parent’s death. A week later, I had a major birthday. I was confronting my own mortality. Ultimately, I developed certain technical approaches to the work. I worked a way where the drying times varied and cracks formed in the surface, keeping the cracks as imperfections. The ruptures in the layers, allowed the history of the work to come through, as in Slip Sliding Away – the last painting in the series, in which color returned. I also went at old paintings with sandpaper, turpentine, and pallet knives. removing all but the most essential of form and color. I then build up a translucent surface which represented the process of aging, imperfections, and deterioration. The Space Between developed this way. Aging can push us to simplify and prune what is unnecessary, allowing our history and essence of who we are to shine through. AS: What’s the genesis and idea behind your recent body of work, The Inscrutable: Our Intimate Selves? Gail Winbury: That is hard as I am still close to the experience. But after a period of nearly 2 years travel and thrilling exhibitions in the States, Italy, Israel, and Germany, it was time to be in the studio. I promised myself at least a year to make a new body of work. But suddenly, I didn’t want to go to the studio. I had no ideas, no concepts, no creative energy. I was in a creative fallow and like most artists thought it would never pass. I forced myself to go to the studio and had my studio assistant make many 38” x 38” canvases. I decided to work in blue because I never painted with blues. Day by day I forced myself to stay and paint for hours, hating it the whole time. I had no idea what I was doing except painting. But I began to amass this odd and quirky body of work. Thankfully other artists stopped by. One of them came by and said “I’ve never seen that before, they’re all connected, they are mental states.” At that moment I realized I was keeping a visual diary and that each painting represented a different mood. I was painting myself out of the slump. I thought of D.W. Winnicott, a British pediatrician who wrote about the “True Self”, a part of the self that develops before the acquisition of language. The “true self” is the source of creativity. These paintings, each different, are like facets on a prism which add up to a whole. Hence The Inscrutable: Our Intimate Selves, The Shadow (knows), or The Enormity of it all, which is one of the last in the series. Contact the gallery for more information. Listed in "Art in America-on-line"
A 4 person exhibition at St Peters University Fine Arts Gallery, reception December 15th from 5-7pm, Jersey City. This is an exciting and challenging exhibit and the perfect way to kick off this new art season! Join these award winning, international artists living in Pa. N.Y.C and New Jersey in a visual conversation about stretching the boundaries of what comprises a painting in 2017. Come view the work of artist who are established and emerging. These artist exhibit globally in Germany, Israel, Japan, Singapore, Georgia, Mexico and else where. 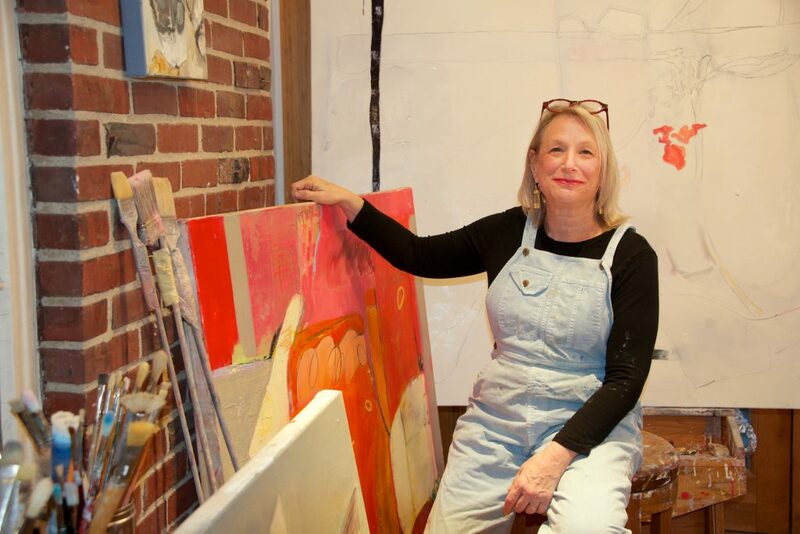 Jointly a few of their awards include Joan Mitchel Foundation Awards for Excellence in Painting, American Academy of Art Awards, NEA Awards, and more. They teach at Universities, have catalogs of their works, are excellent artists and this provocative exhibit is not to be missed! Come join us. Opening in August at Emerge Gallery in Saugerties, New York, Black and White. Go to the exhibit or view the gallery on line. I have two drawings in the exhibit . ''Slip Sliding Away" ,oil on canvas, 48x38, 2016. Now on view in the Ellarslie Museum, Trenton, NJ. Open May 6-June 25, public opening tonight 6-8pm. 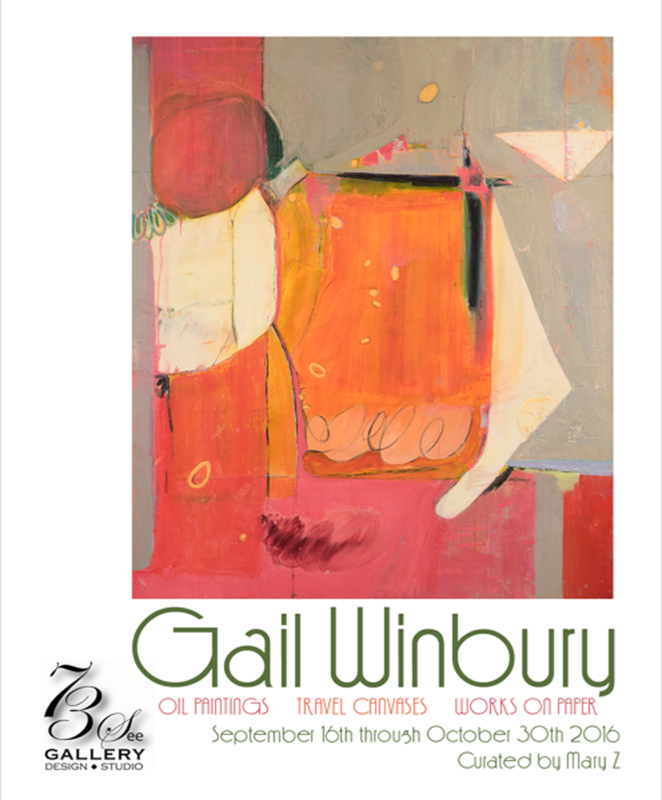 A catalog of my work is available on AMAZON: "Gail Winbury, Oil Paintings, Travel Canvases and Works on Paper" , edited and designed by Mary Scotti. Included in the catalog is an excerpt from an essay on Winbury's work by international Curator and Journalist Lily Wei, a Curators Statement, and an artist statement. Beautiful exciting imagery and essays. Mariainne Trent, and Gail Winbury (curator). Live music. Artisti talk, November 1 from 1-3pm. October 8th, 6-8pm Contrasting Abstractions, curator Virginia Butera, Ph.D.
"Seven outstanding mid-career artists " show their work. Gail Winbury has 5 paintings up through February 2016. October 2-30th, Gail Winbury's oils are in the Jersey City Museum. Was a fellow with the Bau Institute in Otranto Italy from June-July, 2015. Beginning, Friday October 17th, Gail Winbury's paintings can be viewed in at The Art Project Gallery , Saturdays,109 Christopher Columbus Drive, Jersey City. Beginning November a solo show at The Tenth Muse Gallery, Maplewood New Jersey. Coming this winter, a solo show at Hotel Tides, Asbury Park New Jersey, dates to follow. 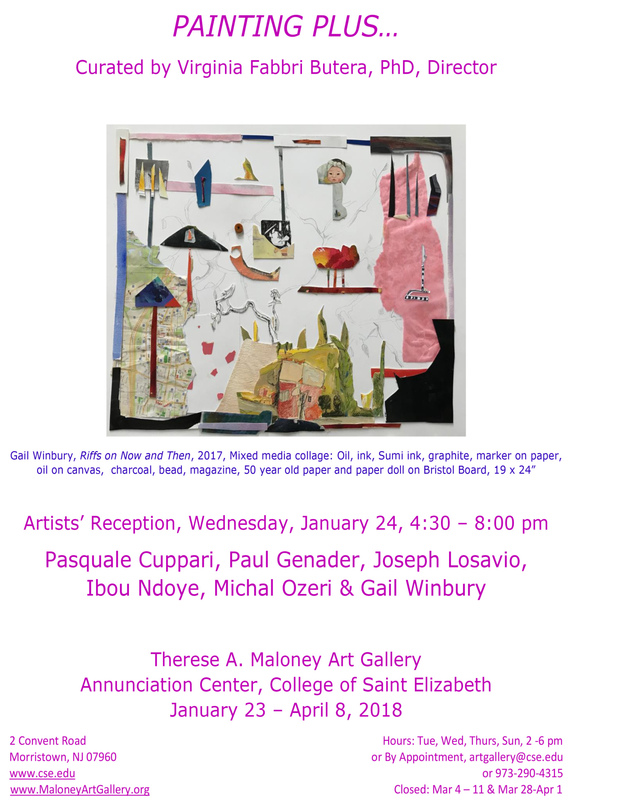 Opening October, 27th- December 1, 2014, 40th anniversary exhibit, in the Gallery at the Massachusetts School of Professional Psychology, Boston Mass. Due out in October, The Cello Suites of Bach, Steven Handcoff, including painting Sarabande, by Gail Winbury. 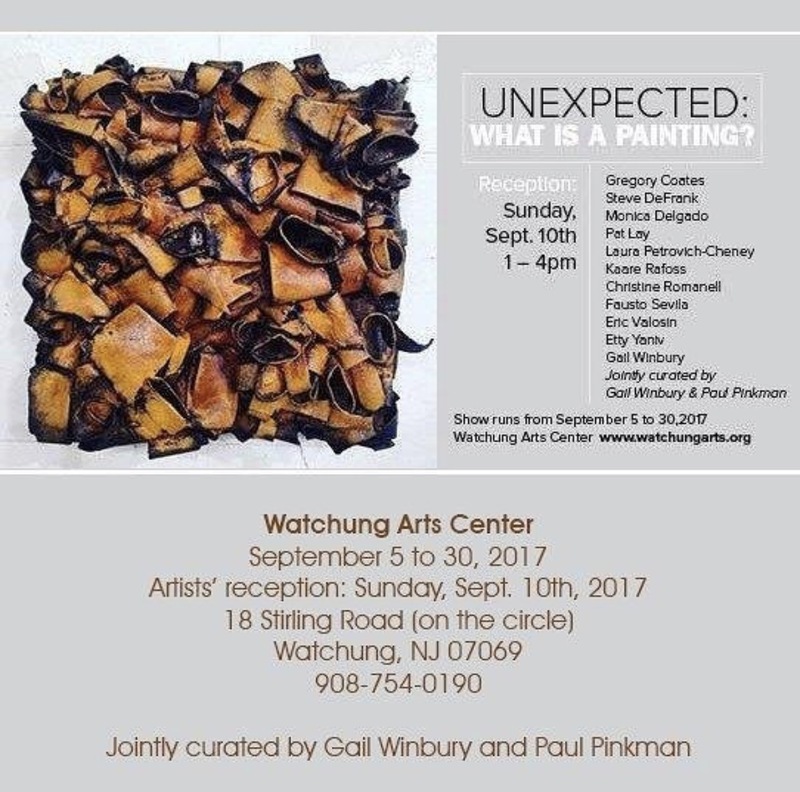 September 19 -20, 2014, "Wild Ginger" a two person show of the recent paintings of Francesca Azarra and Gail Winbury, Gallery U, Westfield, New Jersey. 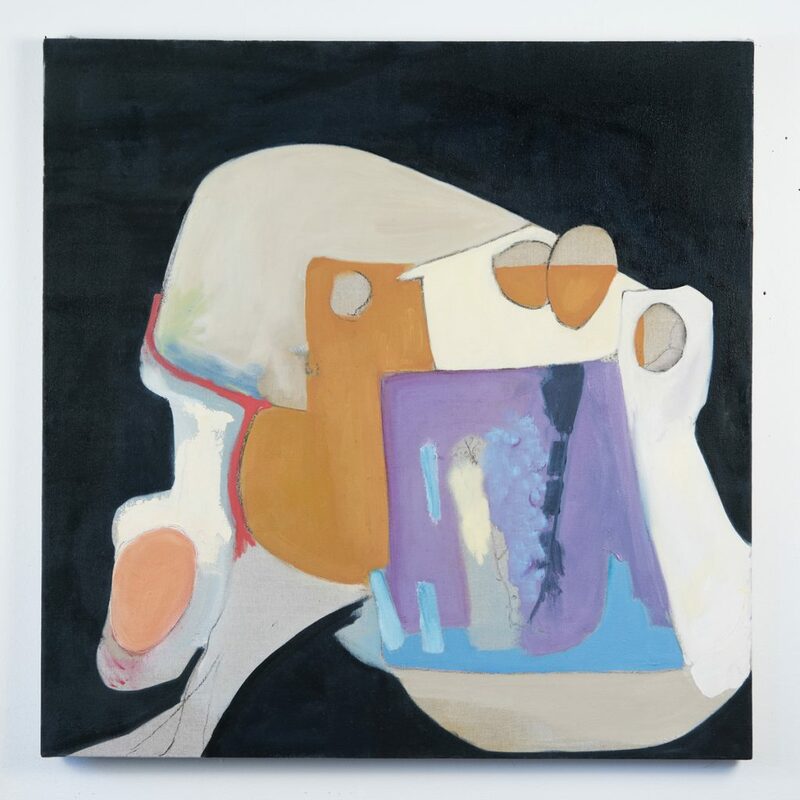 July 2nd, 2014 is an open studio exhibit of new and experimental paintings by Gail Winbury at the School of Visual Arts, floor 9, studio 901. Other artists from around the world will show in their studios as well From 6pm- 9pm. Gail Winbury was accepted into the Ellarslie Open XXX1 at the Trenton Museum, Caldwaller park, Trenton, NJ. vip opening friday may 2nd, 6-8pm ($15 at the door). public opening saturday may 3, 6-9pm. (juror-Kelly Blum, PH.D.., Princeton University Art Museum). 2 paintings are included in Mansions in May, a designer showcase and fund raiser at Blairsdon house, Peapack, Gladstone, NJ. May 3-30th.